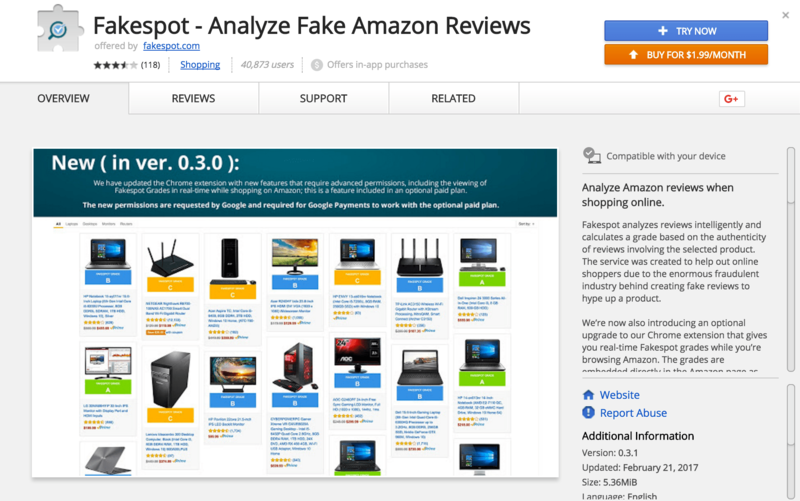 So I just found out a Fakespot, a website that analyzes Amazon.com reviews and gives it a grade from A to F, A indicating that its reviews are reliable and trustworthy and F indicating the reviews are dogshit and fake. I was thinking it would be great to have this context along any Amazon.com product while I’m browsing, so I went searching for an extension. They do have a Chrome extension, but they charge $2/month to use it. If there was a small one-time fee, I would’ve purchased it immediately, but requiring a monthly subscription is a bit too much for its utility. Funny thing is it looks like their Firefox and Safari extensions as well as the iOS / Android apps are free, making me feel even less inclined to pay them. Anyway, I decided to write a bookmarklet you can easily add to your bookmarks toolbar so when you’re on any Amazon page, clicking on it will take you directly to the Fakespot page.